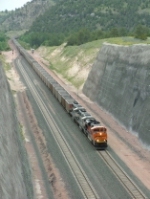 Description: Empty coal train rolls North through the site of the former Tunnel #2. Description: Coal train C-EMTPED at the diamonds on a snowy December morning. Description: Inbound C-ETMPED for ADM. Description: H-LINNTW1 takes the long way to Northtown Yard. Description: Empty Palos, AL to Coal Creek Mine, WY coal train E-PAMCKM0-02 leaves Iowa behind as it crosses the Missouri River and enters Nebraska. This train was routed up the Napier Subdivision to Pacific Junction where it enters the Creston Subdivision for movement to Lincoln. This is the preferred routing for empty coal trains out of Kansas City to minimize cross traffic of the St Joe Subdivision at Carling (east end of Lincoln Hobson Yard). SD70ACe 9131, SD70ACe 9149, 0 loads, 135 empties, 3233 tons, 7498 feet, rear DPU BNSF ES44AC 6344. Description: This train sneaked up on me. Description: BNSF Lincoln, NE to Kansas City, KS manifest train H-LINKCK1-14 approaches the A Street overpass on the St Joe Subdivision as it departs Lincoln. The EMD LNG Test Set trails in the locomotive consist. BNSF AC4400CW 5621, CREX ES44AC 1313, KCS AC4400CW 4586, BNSF LNG SD70ACe 9130, BNSF LNG Fuel Tender 933501, BNSF LNG SD70ACe 9131, 80 loads, 44 empties, 11822 tons, 7774 feet with power, and ETD BNQ 42815. Title: BNSF LNG Set in the Snow! Description: BNSF's LNG (Liquified Natural Gas) ACE's waiting to be picked up from the TTC (Transportation Center) east of Pueblo, CO.